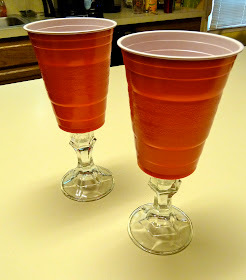 Make it easy crafts: Solo cup picnic wine glasses—conversation starter? Solo cup picnic wine glasses—conversation starter? You don’t want to take your fancy wine glasses outside to a picnic or out on the deck, so what happens-- you are stuck using those big plastic cups, right? Wrong! Just hit the thrift shop or craft store and grab a couple of inexpensive glass candle holders and some E6000 glue and you can create some unique Picnic wine glasses, which double as a great conversation starter!! 1. Run a bead of E6000 glue around the top rim of the candleholder. Center the bottom of the plastic cup on the prepared candleholder. 2. Let it dry for at least 24 hours and you are all set. Enjoy. Note: You must use E6000 glue. You can find it in craft stores, and discount dept. stores. I received no remuneration for recommending this glue; it is quite simply the only one that works. I recommend hand washing. These are hilarious! And you're so right about the E6000, it is absolutely the only thing I've found that works on glass. What a fun idea! I love, love E6000 glue. It can really work miracles with gluing glass. Thank you so much for linking up to our Weekend Wonders link party! LOL! Those are great! Takes Red Solo Cup to a new height! Oh my gosh...these make me laugh! I know someone who works for Solo cups and would just love this! I'm going to share it on facebook! What a cute idea! Stopping by from Be Colorful Monday party! Have a great day! What a cute idea with the Solo cup. I've tried this with Mason jars, but unfortunately, they came apart fairly easy. I am still on the hunt for a good glass to glass glue! These are hilarious! Next kegger I am so doing this! Too bad I'm pregnant, so it is going to be a while!!! Thanks for sharing it. Also, very inspirational blog. I am happy to be your newest follower. I would love it if you'd stop by my little blog: dosmallthingswithlove.blogspot.com and return the follow. These look quick and easy not to mention stylish! I am a huge fan of E6000! Love these red Solo cup stemware! Do you know that gift shops around here sell these! For a lot! LOL, I have seen these and now want to make them myself. So funny! Haha, love it! And thanks for the tip about E6000, I have a tiny chip broken out of the lid of a glass jar and tried super gluing it, but it didn't work :-( Thanks for sharing at The Fun In Functional! Redneck Chic ... Love it! Loved it and couldn't wait to feature it on this week's Motivated Monday at BeColorful. Thanks for sharing. Saw some of these in a store this weekend....so neat. Thanks for sharing. This is too fab. I can see several of my relatives using these. Thanks for sharing on Tout It Tuesday. Hope to see you tomorrow. I love them! You know I saw some similar to these in a store recently and they were selling them for something crazy like $10 each. These made me laugh. What a clever idea. I'd love to see that at One Creative Weekend! on OneCreativeMommy.com.